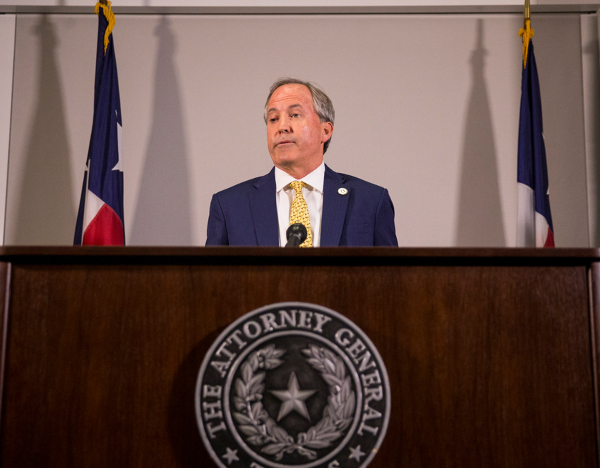 By W. Gardner Selby on Monday, July 9th, 2018 at 4:55 p.m.
As of June 2018, Ken Paxton appeared to be the nation's only indicted statewide elected official. That was no longer so later in the month. Ken Paxton, the Texas attorney general indicted in his first year holding the office, no longer appears to be the nation’s sole indicted statewide official. That’s because a federal grand jury recently issued a 22-count indictment of Allen Loughry, a member of the West Virginia Supreme Court. A listener to the Texas Standard, a public affairs program headquartered at KUT, Austin’s NPR affiliate, brought the indictment to our attention. In June, before Loughry’s indictment, we found True a claim that Paxton had just become the "only statewide official in the country under indictment." That statement was made in a May tweet by Justin Nelson, the Austin lawyer nominated by Texas Democrats to face Paxton, a Republican, on this November’s ballot. Nelson staked his claim to the indicted Missouri governor, Eric Greitens, having declared his plans to resign. But about two weeks after our fact-check published, according to a June 21, 2018, Associated Press news story, a federal grand jury charged Loughry, already suspended from the bench, with 16 counts of mail fraud, two counts of wire fraud, one count of witness tampering and three counts of making false statements to a federal agent. We’re not changing our rating of Nelson’s claim, which was factually supported when he spoke. Then again, as of June 20, 2018, Paxton and Loughry appeared to be the nation’s only statewide officials under indictment. Paxton was indicted on charges of securities fraud in the summer of 2015 though the case has been mired in a dispute over how much several appointed prosecutors will be paid. The AP story from West Virginia states that according to Loughry’s indictment, the charges against him stem from the justice making personal use of a state vehicle and credit card, including trips to book signings and to visit family. According to the indictment, Loughry also sought mileage reimbursements for trips even though he drove a state vehicle and used a government credit card for gas. Further, according to the story, the indictment accuses Loughry of moving a leather couch and a valuable historic desk from Loughry’s state office to his home during office renovations; and of lying to federal agents about his actions and trying to influence an employee’s testimony. Loughry was elected to a 12-year term on the court in 2012. In July 2018, the state court’s website continued to list him among justices and staff. But the entry under his name had an asterisked caveat stating, in red: "Suspended without pay, and prohibited from hearing any further civil or criminal matter or performing any other judicial functions during the pendency of the judicial disciplinary proceedings." West Virginia officials including Republican Gov. Jim Justice have called for Loughry to resign, according to a June 25, 2018, news story in the Charleston, W.Va., State Journal. That story says Loughry had been under public and media scrutiny since October 2017 when news reports said Supreme Court justices had spent hundreds of thousands of dollars in taxpayer money to remodel their offices. — Justin Nelson, Tuesday, May 29th, 2018.